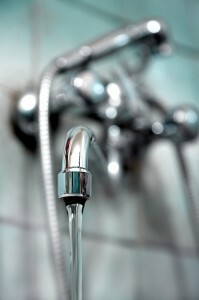 Nickel faucets are similar to stainless steel and chrome in that they’re silver. The main difference lies in the finish – they’re matte or “brushed,” not shiny. That said, nickel fixtures can last a long time, and their matte finish hides things like fingerprint and water spots very well. Because true antique fixtures can be expensive, hard to find, and are fragile, it is easier to purchase a newly made faucet with a distressed or antiqued finish that makes it look old. These faucets come in a variety of colors, from antiqued bronze to distressed chrome, and work best in houses that have an old-fashioned feel. Stainless steel and chrome are two of the most popular faucet finishes. They come in many different styles, and are silver in color. Chrome is harder to care for, and requires plenty of scrubbing to prevent it from tarnishing. Stainless steel is easier to care for, but can dull fairly quickly, leaving you with a less shiny fixture. Real brass fixtures are expensive and need a lot of care. This is why newer models are available in the same gold or brass color, and are made of less costly low maintenance materials. Some of the most common of these are coated in a heavy duty epoxy that is baked on. This gives the metal the appearance of brass, but without all of the fussiness.